PBC stainless steel housings are available in sizes from single cartridge up to 5 cartridges multi-round. 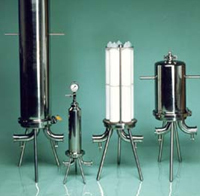 The PBC series is designed and manufactured for sterile filtration in pharmaceutical and biological applications. In- and out- connections are Tri-Clover type 1.5″ or 2.0″ with internal surfaces polished to 0.5 Ra.